Hey everyone! So I thought I would kick-start 2017 with a wonderful comfort food dish, shepherd’s pie. 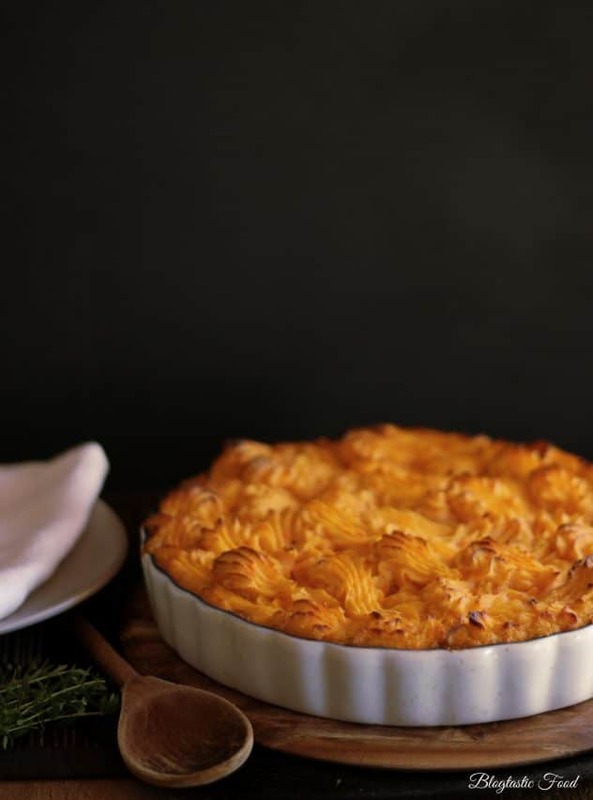 This dish is actually inspired by my mother, she always loves to cook shepherd’s pie on a cold evening. And she loves making mash potato, but she would always add sweet potato without telling me because I used to dislike it. However, I never noticed it, and I loved it. So I decided to merge the two together, and it worked out brilliantly. The slightly sweet and light mash goes very well with the rich lamb filling. 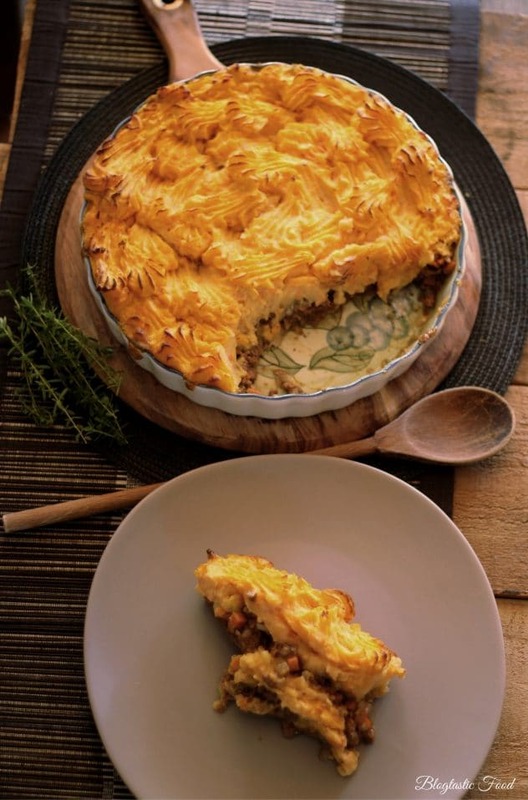 What I love about Shepherd’s pie and that whole cottage feel it has (after all, a shepherds pie alternative is a cottage pie), is that when you serve it in the middle of the table, the dish simply spells out “good food, happy days”. And although you can present it nicely, it’s impossible to get all petite and pretty with a dish like this in my opinion. This is how I like a majority of my food when it comes to home cooking, so this is the kind of food I am going to be showing more of in 2017. Shepherd's pie with a bit of a twist on the mash. Use you clean hands to mix the lamb mince, breadcrumbs and a pinch of salt and pepper together in a bowl. Pre-heat a pot or a large pan, get it nice and hot so you can brown the meat nicely. Add a glug of olive oil then add your lamb mince. Use your spoon to break the mince up so you don't end up with meatballs. Once the mince is browned off, transfer it to a bowl. Turn the heat down to about medium heat, then add your onion, celery and carrots then sweat off in the pot/pan for about 3-4 minutes. Next, add in you garlic, thyme and rosemary and keep frying for another 1-2 minutes. Put your lamb mince back into the pot, then add the cornflour and stir through. Add your red wine, beef stock, Worcestershire sauce and tomato puree. Stir through, bring to the boil and then turn the heat down to a gentle simmer. Leave to simmer for about 20-25 minutes stirring occasionally so that the mixture doesn't stick to the bottom. Finally, season to taste with salt and pepper, then set aside. Get a pot of salted water, add your diced potato, then bring to the boil. Once the potato is slightly cooked, add your sweet potato. Once the potato and sweet potato are both cooked through, drain and then add back in the pot on low heat. Add your butter, nutmeg, milk, a generous pinch of salt and a generous pinch of pepper. Use a potato masher to mash until smooth, then turn the heat off and set aside. 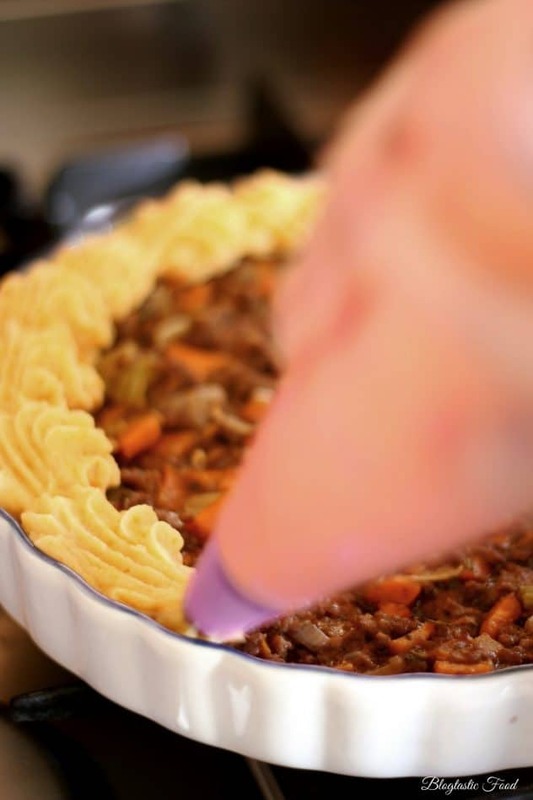 Fill a pie dish with the mince filling (make sure you leave some space for the mash). You can then either spoon the mash potato mixture over the top and smoothen it out, then perhaps put some fork marks in the potato to give a nice appearance once browned. Or, you can do what I did and pipe the mash potato on top using a star nozzle. Finally, put the pie in the oven for about 30 minutes to brown on top. Afterwards, you can finish it under a hot grill for a minute or two if you wish. Remember, if you don't have a piping bag, no big deal. Spoon the mash on top and use the forks to leave marks in the mash. That will also make the dish look presentable. This looks amazing! 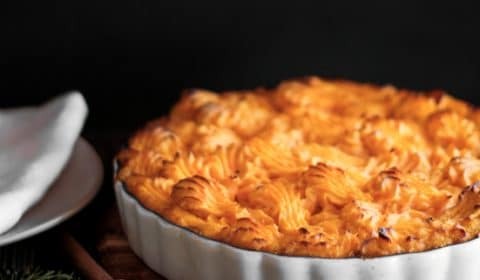 I love that you used sweet potatoes for the topping. Thanks so much (: The sweet potato worked really well. 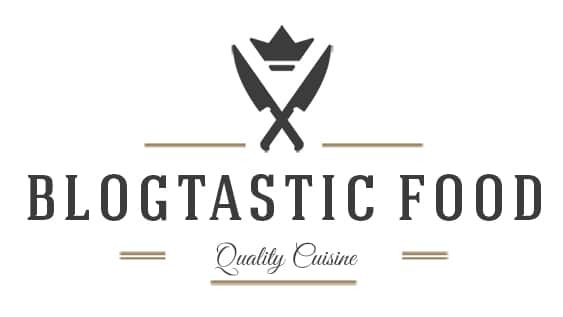 Keep up the good work on your blog. I love this recipe. Sweet potatoes are a great addition to Shepherd’s pie. I made these last night, and they were awesome! Thanks for sharing this recipe. May God bless you. Mmm that was my dinner last night! I’ll have to tell my Englishman to try adding sweet potato. The children said it would have been nicer with more carrots so sweet potato would probably also do the trick.